Jean Harleywife, mother, lover, danceris a shining light in the lives of those who know and love her, full of boundless energy, compassion, and joy. When she's hit by a truck while riding her bicycle and the unthinkable happens, what becomes of the people she leaves behind? Her devoted husband, Stan, is now a single father to their four-year-old son, Orion, who doesn't understand why his mom won't come home. Jean's two best friends, Neddy and Viv, find their relationship unraveling without their third companion. Charley, the ex-con who caused the accident, struggles to reconcile his feelings of elation when the charges against him are dropped with his boundless guilt over knowing he has changed a family forever; while Jean's mother, Pearl, will regret the little girl who left. Gradually, life without Jean goes on, yet her indelible spirit remains. 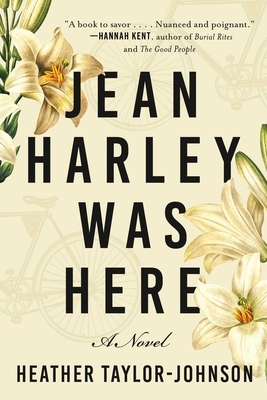 Told from the alternating perspectives of these and other characters who grieve the same death in vastly different ways, Jean Harley Was Here is a moving, poetic novel about loss, memory, and the lives we touch. Heather Taylor-Johnson was born in the United States and has lived in Australia since 1999. She is the author of four volumes of verse and a previous novel, published in Australia, called Pursuing Love and Death. She is the editor of Shaping the Fractured Self: Poetry of Chronic Illness and Pain. She lives in Adelaide, Australia, where she is a Fellow at the J. M. Coetzee Centre for Creative Practice. "Heather Taylor Johnson has a poet's understanding of the world: her exploration of the way in which our lives intertwinefor better or for worseis nuanced and poignant. A book to savor. "Hannah Kent, bestselling author of Burial Rites and The Good People.